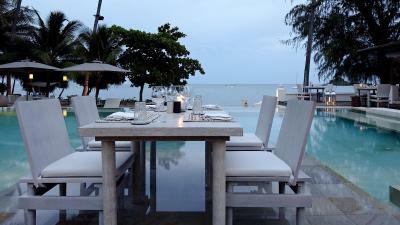 Lock in a great price for SALA Samui Choengmon Beach – rated 9.3 by recent guests! We spent many hours at our private pool, after sunset that the beach and outdoor public pools of the resort can't be used. The restaurant serves great Thai and multinational food. The atmosphere is peaceful and nice to look at. Staff are amazingly friendly and professional. I loved the location and the beach front. Very relaxing beach. The pool villa was great! The beach massages were also great and super cheap! Everything was great. Starting from the staff and check-in experience up to the room and facilities. One of the best hotels I have ever stayed in. The beach was not crowded. The room was clean. House keeping was excellent. Good breakfast. The area where the hotel is in, is very quiet and has nice restaurants nearby. 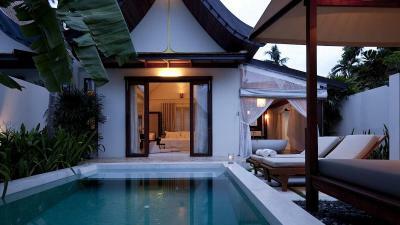 The pool villa was great and if you plan to relax in Samui then this hotel would be the best choice. 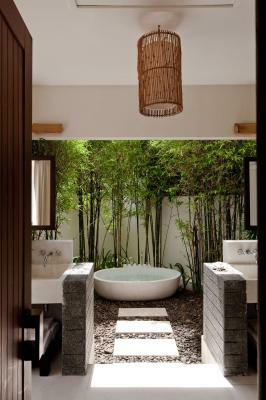 The elegant design, excellent peace & quiet with nature. Great service. Great atmosphere with an amazing pool with a garden. I loved how the bathrooms were outdoor. I’d go back again if I’m in Koh Samui. Very friendly and professional staff! Great breakfast with excellent service! We will come back! Thanks to the whole team! The best hotel I ever stayed. The service is super super nice and the breakfast is the best of the best. Beautiful breakfast as always. In our room none of the remote controls of the TV were working. 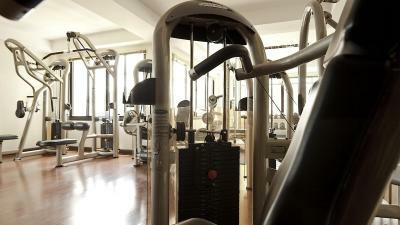 In the upstairs gym are too many machines to walk around. Less is sometimes better. But we love the place and would go back any time. Amayzing family vila! Large pool, perfect beatch, service is top notch. Beautiful facilities right on the beach. Very helpful and polite staffing. Everything was perfect, from location to the staffs. 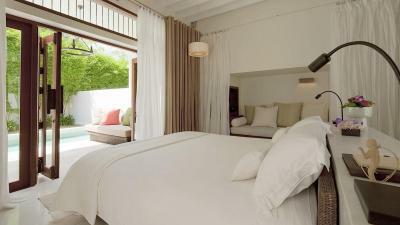 SALA Samui Choengmon Beach This rating is a reflection of how the property compares to the industry standard when it comes to price, facilities and services available. It's based on a self-evaluation by the property. Use this rating to help choose your stay! 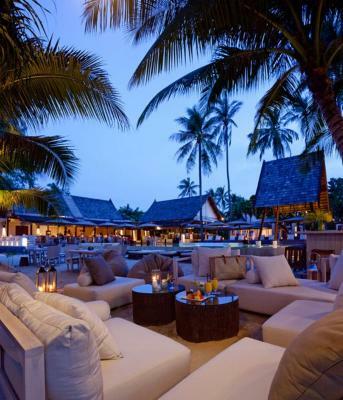 One of our top picks in Choeng Mon Beach.Located along Koh Samui's Choeng Mon Beach, SALA Samui Choengmon Beach offers modern facilities complemented by traditional Thai architecture. It features an 250 feet private beach and 2 beachfront pools. 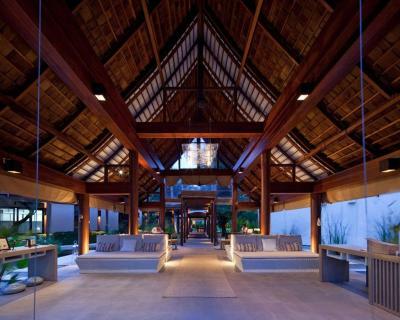 SALA Samui Choengmon Beach is a 10-minute drive from both Samui Airport, Fisherman's Village and Chaweng Center. 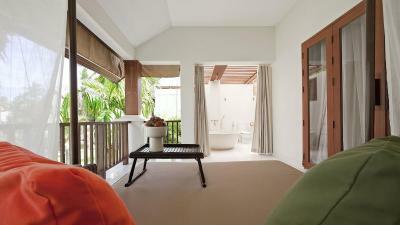 Rooms come with private balconies or terraces and outdoor bathrooms. Amenities include cable TV, a DVD player and tea/coffee making facilities. 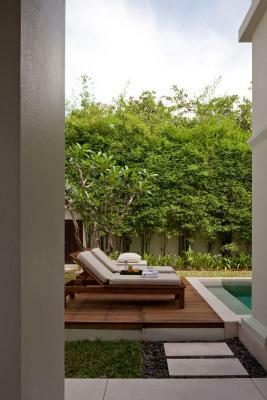 Some villas feature a private pool with a sundeck. 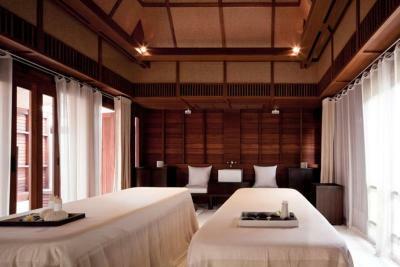 Guests can enjoy a massage in one of the spa pavilions, or exercise in the fitness center. 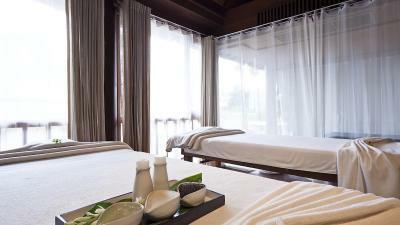 SALA Samui Resort also has a tour and activities desk, a library area and a business center. 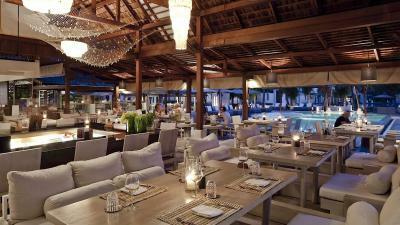 Both SALA Samui Restaurant and Pangea Restaurant & Bar serve Thai and international dishes. The beach bar offers indoor, outdoor and beach seating. In-villa dining is also available. 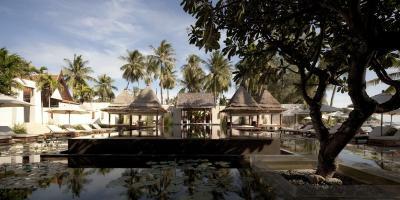 This property also has one of the top-rated locations in Choeng Mon Beach! Guests are happier about it compared to other properties in the area. This property is also rated for the best value in Choeng Mon Beach! Guests are getting more for their money when compared to other properties in this city. 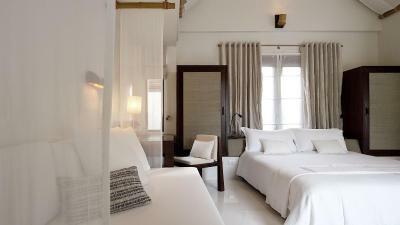 뀐 Located in the top-rated area in Choeng Mon Beach, this property has an excellent location score of 9.0! 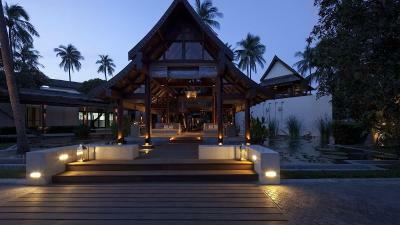 When would you like to stay at SALA Samui Choengmon Beach? 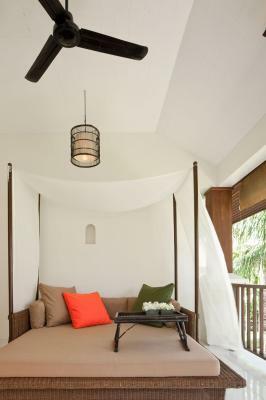 This spacious, air-conditioned room features a large balcony with a full-size outdoor daybed overlooking the garden courtyard. 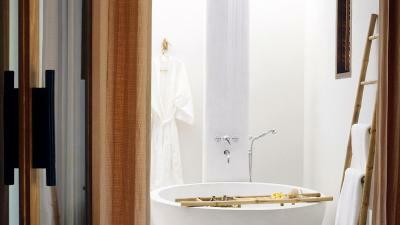 The open-air bathrooms are complete with rain shower facilities and an oversize bath. 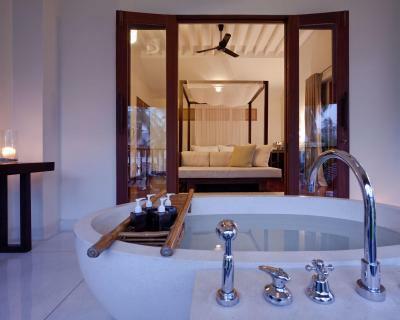 Villas feature a patio, private swimming pool and open-air bathroom with a bathtub and rain shower. 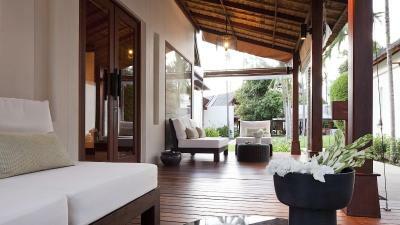 Features a garden, swimming pool, daybeds and outdoor bathroom with bathtub and rain shower. 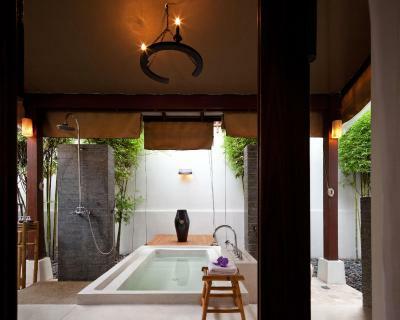 This spacious freestanding air-conditioned villa features a separate living room and an open-air bathroom with rain shower and twin vanity. 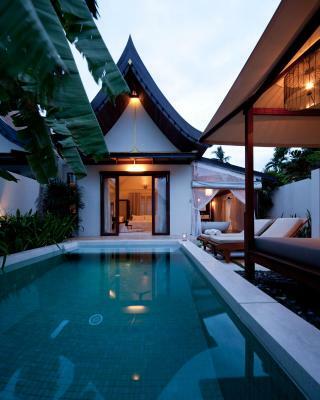 Villa features 2 bedrooms and private pool. 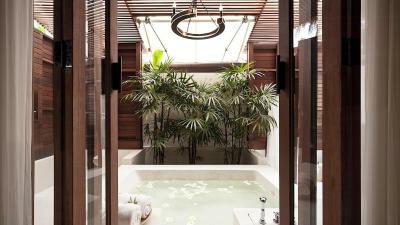 The master bedroom has an open-air bathroom with a bathtub and outdoor shower. The villa is equipped with a 32-inch flat-screen TV, home entertainment unit and semi-automatic coffee/espresso facilities. Spacious duplex villa features a private pool. 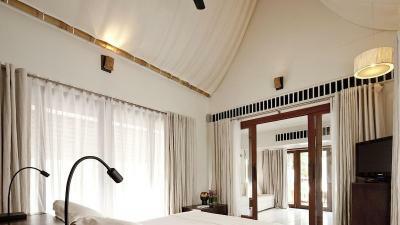 Located upstairs, the bedroom has a balcony and open-air bathroom. The living room comes equipped with a 26-inch flat-screen TV and home entertainment unit. 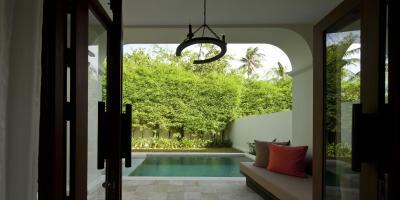 This villa features 2 bedrooms and a private outdoor pool. Each bedroom has an open-air bathroom among the garden with a bathtub and outdoor shower. It also comes with a living area with a daybed. This villa features a flat-screen TV, sofa and seating area. 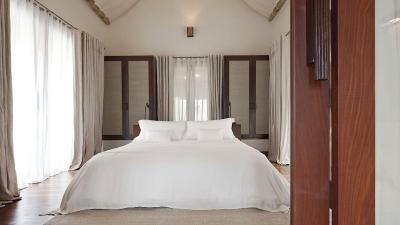 House Rules SALA Samui Choengmon Beach takes special requests – add in the next step! SALA Samui Choengmon Beach accepts these cards and reserves the right to temporarily hold an amount prior to arrival. The functionality of the room design was poor. The swing access door to the bathroom catches on the curtains. The bathroom is far too hot without any fan option and the lighting in the bedroom is poor. The ac was noisy and the room never got below 24 degrees so sleeping was sometimes uncomfortable. Too many large families with children dominating the main pool. The adult only pool was too hot and water warm. The restaurant lacked sufficient fans per table so again eating was uncomfortable in humidity. Such a shame because this hotel had the potential to deliver a score of 10! The complimentary mangos and dried fruit in the room. A choice of pillows and body lotions and soap. The design of the hotel was beautiful, the sun bed options were varied. 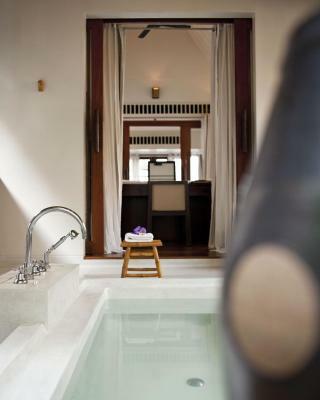 Complimentary water to sun bed service and speciality tea to room in the evening. Inclusion of non alcoholic smoothies and mocktails during happy hour. The location on the beach close by to local restaurants and massage etc. Quiet setting. Breakfast smoothies and coffee were excellent. Choice of a la carte breakfast were interesting and well presented. Breakfast option of 6.30 am in room helpful on transfer or excursion days. extremely noisy due to construction just next to the hotel. we could not enjoy the privacy at our pool villa because of constructing workers were watching us from their working place which is higher and has a good view over the villas. this is very pity. Breakfast was wonderful. We had received an upgrade of our room and late check out due to our evening flight. personnel was very polite and helpful. Restaurant offers a really high class of food and service. Every single member of staff we met were service focused: professional; knowledgeable; courteous; happy to help; and best of all, they all wore huge smiles. My wife and I stayed in a one bed duplex villa, arriving with high expectations from the on-line description and photographs, we were delighted to have expectations exceeded. 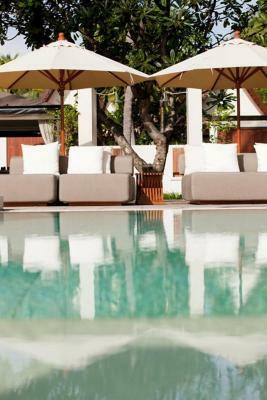 Our villa, as well as the pool were serviced regularly. Food at the restaurant was outstanding...great variety, cooked and presented beautifully. The accompanying entertainment was also high quality and thoroughly enjoyed. A very memorable stay for all of the right reasons. Unreservedly recommend. Staff were amazing the way they handled our requirements and demands right away , Breakfast was truly amazing and the Spacious villas was a good deal to all those looking for comfortable size Villas ! Chanon , Nana and Fang (not sure if I spelled that one right) all the staff members were amazing and the spa was clean with an extremely great massage which was complimentary from their end ! Will definitely recommend to all family members and friends ! we didn't like the villa they gave us when we checked in so they immediately changed it for us to a better one of our choice ! Couldn't ask for more !! Will come back again for sure if I ever visit Samui again. Great breakfast . Amazing beach . Nice staff. We had a great Holiday stay . Zhank you for the late check out. 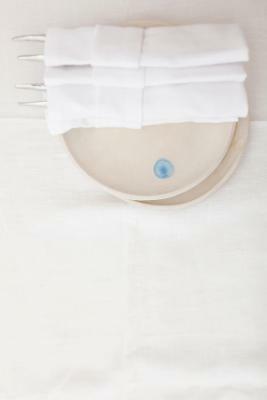 Nothing much: Room would need more light at night and pay attention to mosquitoes when opening bathroom door! Will always remember our incredible honeymoon stay to Sala CM! Hotel is great, staff is friendly and we were even offered flowers, special room decoration and an amazing massage at the spa. 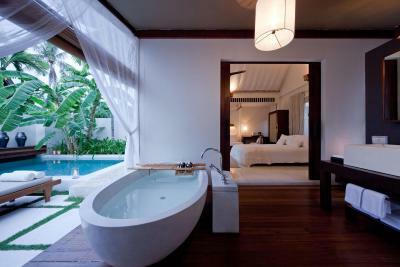 Our garden pool villa was amazing: confortable, clean and beautiful. The private pool really is a +. Outside bathroom can sometimes feel odd but we get used to it quickly. Delicious breakfast and great pool food/drinks (daily happy hour), although food is a bit expensive for Thailand. The beach is amazing and the adults only pool offers calm and is perfect for relaxation. You need to get a taxi to go anywhere else. 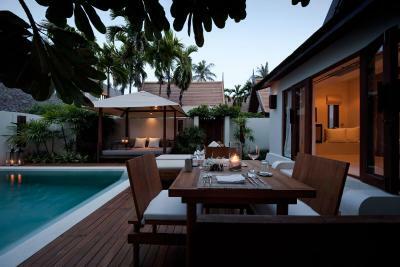 Nice resort with amazing pool villa on a clean and quiet beach. There are a few restaurants and bars you can walk to outside the resort or just stay in your villa and order room service on the mobile app and never leave! Difficult for the staff to control but the beach is somewhat of a thoroughfare with travellers from other accommodation migrating to Sala’s pools /facilities and beach due to it being superior. Staff were unbelievable; attended to requests immediately and were always polite, friendly and respectful. Facilities, gardens and accommodation were maintained immaculately. Beach is pristine. Great service when relaxing on the beach - towels provided, day beds reserved, water offered periodically and full food and drink service offered to the beach. Peaceful location yet has everything you would need with food, drinks, mini-mart, pharmacy and massage offerings. Overpriced for the size of the rooms. I felt the rooms were a little cramped, the balconies were huge and could've been smaller to allow more space inside the room. The massive swivel door to get into the bathroom was really annoying! It gets caught on the curtains and such a pain if you are trying to use the bathroom in the middle of the night and trying not to wake anyone up. The mirror and cupboards are in the bathroom outside - again annoying but bearable after we started using the balcony door to go to the bathroom instead of the swivel one. Seriously who thought that huge door was a good idea!? Aside from the price I'd say the rest are minor points which I hope the hotel owners will take into account but considering the service from the staff we were otherwise very happy with our stay. The staff were amazing, compared to our stay at The Tower Club at Lebua, this is what you call service! We were picked up from the airport and taken to the hotel, offered cold towel and drinks on arrival. Check-in was a 2 minute process and we were taken to our rooms and shown around all the features the hotel had to offer. The pools were nice and clean and fairly quite given the amount of people at the hotel. Breakfast out doors with an fantastic view of sun sand and sea, this is something you want to wake up for! The beach is relatively quite, the sand is nice and soft, its definitely much cleaner and I'd say better than Chaweng area. 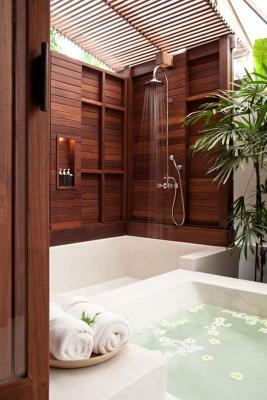 Great for rest and relaxation. We were warned about some noise from the construction happening next door and thought "great, just what we need! ", but we actually didn't hear a thing, however appreciated the honesty of the staff and the advanced warning. Restaurant and bar prices were a tad steep, but this is to be expected at a 5 star resort. Plenty of well priced food and drink options in the main street just around the corner from the resort. Simply amazing. Beautiful villa with the most friendly and helpful staff you could ever hope for. Facilities at the resort were fantastic. Breakfast included was a bonus and the available options were enough to keep us interested every morning. Resort located a short ten minute ride to the main Chaweng area.